The McMourning crew makes small shuffling steps of progress. At a recent painting day I brought models to work on, and promptly forgot the colour steps I was working with :/ Small areas of green are appearing on a few models though, so that's at least some progress. Pictured above is one of the Crooligans. 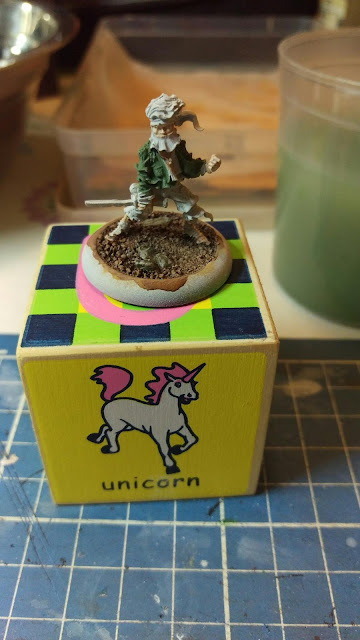 OzPainters had a basing challenge, and after hastily constructing this base, I managed to get it painted in about 20 minutes and submitted with a few minutes left. The model's paint job is a rough one, and the base matches it, but it's good enough for a bit of drama on the table top.